Spent last Sunday down on Ron's new little runabout boat on the bay. 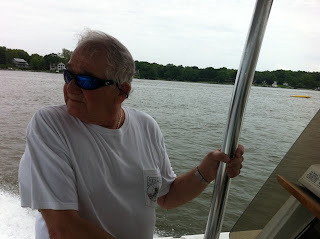 He took us to a beautiful spot where John and I will probably stay overnight on Namaste if I can get away this summer. It's a very quiet cove that's really tucked back. Only 3 feet deep, Namaste can easily make it back there but a lot of other boats wouldn't be as lucky. I'm already seeing towing the dinghy which we just got with it's electric motor and setting up the crab lines. Eating fresh crabs sound like the perfect way to spend an evening on the boat. Mom's doing fine these days. The extra water and continued quest to keep her plugged into the oxygen makes a different. And, since the house is not AIR CONDITIONED, the air is much cleaner and clearer feeling. I'm totally in love with these air conditioning units. What a huge difference they're already making. Wish I'd done this years before but, alas, I'll enjoy them until I sell the place - still a few years off probably. Memorial weekend should find me back on the bay for at least a day if I can get someone to fill in for me with Mom. It's supposed to be a beautiful weekend and, even if I'm home, that's not too bad as the pool is open and tantalizingly gorgeous these days. I've got a nice float and I know how to use it!